Recky “The Terror” Dulay (10(7KO)-2-0) will be fighting in his 3rd fight in America against Albanian Dardan Zenunaj (13(10KO)-3-0) in their super featherweight match that is televised on ESPN Boxing event that also features the main event fight between the Irish Gary O’Sullivan and Nick Quigley from Liverpool, England on Saturday, September 30th, 2017 at the House of Blues in Boston, Massachusetts. O’Sullivan (25(17KO)-2-0) is coming out with 3 wins after his loss to IBO World Super Middleweight champion Chris Eubank, Jr. on December 12, 2015 and his most recent win was against Chauncey Field on May 13, 2017. For the Scouser, boyish looking but tough and determined Nick Quigley (15(3KO)-2-0), this is his very first fight in America after Golden Boy Promotions and ESPN gave him a shot to fight in one of ESPN’s reputable televised boxing event. Thanks to the hard work of Quigley’s trainer, Anthony Martin of Las Vegas, whose persistence and belief on the capability of his boxer certainly paid off when he finally convinced Golden Boy Promotions to give his boxer the opportunity to fight in America. It is fair to say, also, that Nick Quigley’s father, Tony Quigley has been training him since the beginning of his boxing career and still is to this day. Quigley trained in Las Vegas under the strict regiment of Anthony Martin who both promised boxing fans an exciting match worthy of a championship level and will give boxing fans satisfaction and their money’s worth. Exciting match, indeed, as both are forward boxers who like to scrimmage, throw punches and stand their grounds without the boring effect of excessive clutching and grappling common to other boxing fights. Expect either one to go for a knockout as both of them have quick hands with powerful punches. 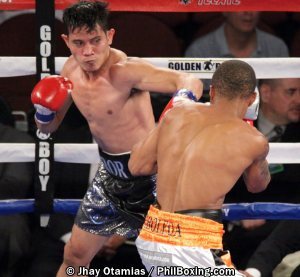 Meanwhile, Dulay, came out with two impressive knockout wins over Golden Boy Promotions prospects Jaime Arboleda in Forum, Inglewood on July 15, 2017 over two months ago and over another Filipino, Noel Adelmita on January 30, 2017 after a loss to Gervonta Davis on September 12, 2015 at MGM Grand, Las Vegas, Nevada. Davis eventually captured the IBF World Super Featherweight title on January 14, 2017 from former world champion, Puerto Rican Jose Pedraza. Dardan Zenunaj, Dulay’s opponent, has a very impressive records having captured the Belgium Featherweight title on December 1, 2012; the IBO International Super Featherweight title on March 23, 2013 and the WBA International Super Featherweight title on November 15, 2014. However, he failed to clinch the NABF Super Featherweight title in a loss to Tevin Farmer on December 2, 2016 but won his last fight against Amiran Abuladze on February 12, 2017. This fight is promoted by Oscar De La Hoya’s Golden Boy Promotions and Ken Casey’s Murphy’s Boxing. Photo: Recky Dulay (L) in action against Jaime Arboleda.